Yisrael Meir Rubisntein, founder and chairman of the school, is a well-known, good Hebrew teacher, the former director of the talmud torah. In his school, at Niewelt(st.?) 6, he teaches the same program as in the "Yesod hatorah" school, but with an emphasis on the teaching of Hebrew as a language. But everything is taught in Yiddish. 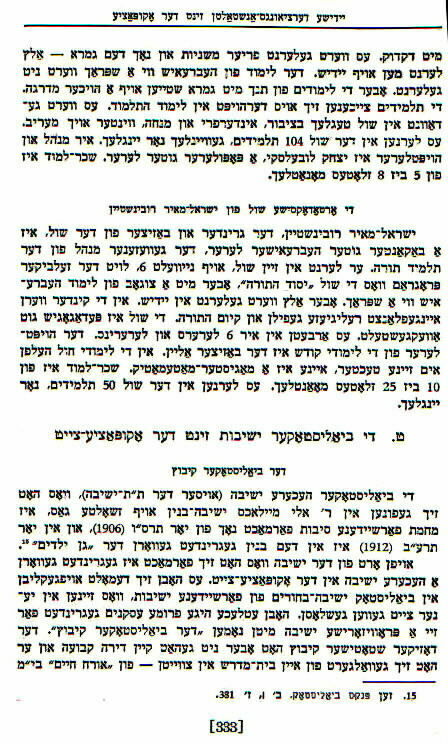 In the children, religious sentiment is combined with Kiyum ha-torah. the synagogue is well-founded pedagogically. Six male and female teachers work there. The head teacher for Limudei Kodesh is the chairman himself. In the Limudei Chol he is aided by his daughters, one with an MA in mathematics. Tuition is 10-25 Zlotes a month. There are 50 pupils in the school, all young boys.